Nowadays, interior design is a choice of comfort and general look whether it is for a small modern bedroom design or an entire home. Many people incorporate modern interior design style into their homes and offices because of its simple, functional nature. Today’s modern style is actually based on a design movement that took place around the turn of the 20th century. Due to this, the modern interior design consists of many different styles, making it a bit more complex to define. In its simplest sense, modern design refers to minimalist decor and light colors. It emphasizes decluttering and simplifies everything. Hence, more and more people are drawn to the simplicity of this style. Modern style furnishings and decor celebrate natural materials, neutral or earthy colors and the elimination of unnecessary detailing. The colors often have an earthier hue and feature shades like rust, turquoise, brown and olive greens. With roots in Scandinavian and German architecture and design, modern style concepts are certainly fuss-free and simple. One of the key beliefs behind the modern design movement is the idea that “form follows function”. In other words, the design of all furnishings and decorative objects reflects its intended purpose. Hence, any furnishing, decor or detail without a practical purpose is eliminated. Modern designs avoid thick, hard lines, burdensome adornment, heavy textile, and big carpets or rugs. Instead, they have an open layout and spacious feel with clean architectural lines, and minimalist decor. The furniture also features bare legs and slim bases to give a more relaxed and open feel. Another feature of this design is the use of reflective surfaces like exposed glass and metals. So, take a look at our collection of sleek and comfortable modern bedroom design ideas for some useful tips to refresh your interiors. The simple layout and clean, straight lines of this decor certainly give it a modern look. The minimalist decor gives the room a fuss-free look. Soft grey, white, and wood tones give a soft and fresh feel. The gorgeous bed and stylish bedside tables from Koskela Furniture bring a modern contemporary look to the design. The open rectangular window above the bed and the balcony open the room to the outdoors. This gives a feeling of being in touch with nature. Fresh flowers and green leaves in the vase and the green pillows give the room a fresh and natural look. The simplicity of design brings out the elegance of the decor. The most noteworthy and unique feature of this bedroom is certainly the quirky layout of the windows! The unique design of the low windows is different and gives the decor a refreshing touch. The white walls and bedding reflect light and give the room a bright and spacious look. Similarly, the grey carpeted floor and low bed gives the room a warm and cozy feel. The colorful chair pillow and red quilt and pillows bring color to the neutral decor. All in all, this room looks like a wonderfully modern and refreshing retreat from the daily hustle and bustle of life! The use of reflective surfaces like exposed glass and metals is another feature of the modern design style. The neutral colors and open layout of this bedroom certainly give it a modern look. Floor-to-ceiling glass walls and sliding doors open the room to the outdoors while giving a great view! The cream tones of the tufted accent wall, curtains, and bedding give the room a soft and light look. In contrast, the dark tones of the hardwood floors and table lamps add color and contrast to the decor. The skylight and open layout let in enough natural light and also give the decor a modern touch. The minimalist decor and soft color palette of this attic bedroom give it a soft and light look. The exposed trusses bring an industrial touch to the decor. The white walls and trusses as well as the white carpet, throw, and pillows give the room a light and spacious look. The black comforter brings contrast and color to the decor. The many skylights and exposed trusses also bring style and pattern to the decor. The unique design of this lofted bedroom makes the decor look even more modern. The open layout of this skip floor design lets in a lot of natural light and also allows for good ventilation throughout the house. The wooden floors and windows give the room a modern touch. Similarly, the leggy beds and furniture give the decor a modern look. The soft colors of the cozy bedding make the room look warm and welcoming. The neutral color palette of this bedroom gets a colorful uplift with this bright bedspread and pillows. The white walls and hardwood floors are a touch of modern design in the decor. The grey accent wall offers a nice contrast and dark tones to the light decor. Similarly, the bright yellow bedspread and colorful pillows bring color and pattern to the decor. Also, the wall art is another typical modern design feature. The hanging pots and plants bring life to the sterile decor. The classic grey capitone pattern chesterfield headboard lifts the look of the entire room. The simple bedroom decor gets a stylish uplift with the tufted headboard, modern style ceiling fan, metal finish nightstands, and open ring lamps. The wooden floors and glass doors further add to the modern look of the room. The comfortable bed, cozy area rug, and soft color palette give the room a cool and serene feel. Large doors and metal-framed windows let in ample sunlight while recessed ceiling lights offer uniform illumination at night. The simple design and minimal decor give the room a modern contemporary feel. Stone floors, wooden furnishings, and leggy furniture give this bedroom a modern look. As is typical in modern style furniture, this bedroom’s furniture also has a lot of leg space which gives the room a spacious and airy feel. The white walls, bedding, and table lamp reflect light and give the room a bright look. However, the most distinctive feature of this bedroom is certainly the large wall bookshelf. The full wall bookshelf also doubles as an accent wall and gives color and pattern to the decor. This modern bedroom decor is simple and yet very stylish and glamorous. The clean lines and sleek edges of this design give the room a modern look. The hardwood floors and glass doors and windows further add to this look. The shiny finish on the bed frame, nightstands, and photo frames also add to the glamour of the decor. The textured rug, black bed, tufted wide headboard, and printed bedcover and pillows give the room a stylish Hollywood look. The glass windows open the room to the great view of the water. This bedroom is the perfect example of a modern take on the art deco heritage. Luxurious velvets, sumptuous fabrics, and decorative wall finishes create a warm and welcoming room, rich in color and deco lux glamour. A blue accent wall and other blue details in the decor give the room a calm and soothing appeal. The shiny finishes and lush fabrics bring warmth and elegance to the decor. Table lamps and wall sconces also provide ample illumination. However, it is certainly the unique design mirror on the accent wall that brings a sophisticated touch and decor glamour to the design. The neutral color palette and the use of natural materials certainly give this room a modern touch. The modern design consists of many different styles like the mid-century modern style, art deco style, etc. This bedroom certainly displays the sumptuous and artistic feel of the art deco style. 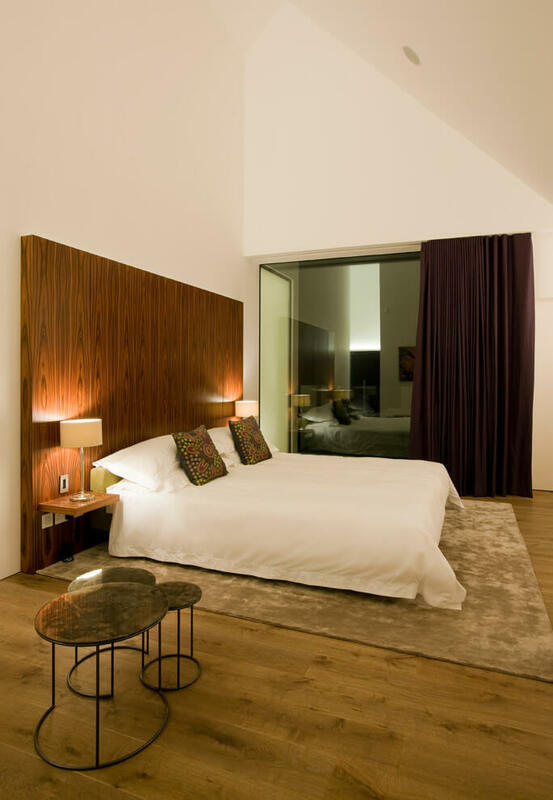 The wooden floors and wooden headboard further add to the modern look of the room. The earthy tones of the decor give it a natural and warm feel. The violet curtains bring some color to the otherwise neutral decor. This bedroom is the perfect example of modernity interpreted in the style of the Victorian Age. This master bedroom decor uses textures and layering to create depth and opulence. The straight lines and clean edges of the decor give the room a sleek and modern look. However, the cozy bedspread, plush carpet, and satiny curtains give the room a warm and luxurious feel. The red details in the curtains, throw, pillows and lighting fixtures also bring some color to the sterile design. The soft color palette of this small bedroom gives it a modern and elegant look. The hardwood floors and large glass window also adds to the modern look of the room. The low bed and nightstands are of the mid-century modern style and also add to the modern appeal of the decor. The combination of cool white and soft grey in the walls, ceiling, and bedding gives the room a soothing and serene feel. The cozy area rug further adds to the comfortable feel of the room. The wall art brings color and pattern to the decor. This design is a perfect example of clear contrasts and clever use of colors and lighting. Due to the position of the door, the corner does not get enough sunlight. So to compensate for that, the designers made the corner into a black accent wall and added hanging lights to illuminate the corner. This adds color to the white and wood decor. It also highlights the classic black bed without taking up much space. The small corner accent wall balances the play of light the room. Modern design furnishings and sleek finishes further add a modern touch to the decor. This glamorous bedroom explores modern luxury with feminine nuances. The soft monochrome palette paired with rich jewel-toned hues gives the decor a luxurious feel. The contrast of light and dark tones in the decor creates visual interest. It also brings warmth to the decor. The pink accents in the decor bring color to the design. The satiny pillows and plush furnishings bring a sumptuous feel and cozy appeal to the room. The beautiful lighting fixtures further add to the glamorous look of the design. This bedroom design feels warm and welcoming despite the all-white decor due to the use of warm white tones. Wooden furnishings, glass windows with blinds and skylights give the room a modern touch. The golden accents lighting bring a dash of color and warmth to the design. The fully carpeted floor and comfortable bedding also add to the warmth of the decor. Moreover, the straight lines and symmetrical design give the room a uniform look. This soothing bedroom design is certainly a modern style design. The use of natural materials like wood and bamboo, the simple, functional design, and the earthy color palette is typical for modern style designs. The hardwood floors, as well as the large wall-length wooden headboard, give the decor a natural touch. The wooden tones also bring an earthy look to the decor. Moreover, the white walls, blinds, and bedding lighten the room and give it a soft and soothing feel. The colorful wall art brings vibrancy and fun to the otherwise sterile decor. The stark contrast of the pristine white walls with the dark wooden ceiling, window frames, and hardwood flooring is the most prominent aspect of this design. The high contrast creates an appealing uniformity throughout the room. Similarly, the dark curtains, bedcovers, throw, and pillows bring a symmetry of colors to the design. The ikat area rugs bring pattern to the decor while industrial lamps and recessed lighting add a modern touch. Moreover, the wall art gallery and separate art pieces give the room a sophisticated look. The small plant brings life and freshness to the decor. This sleek bedroom design is modern and yet very soothing and serene. The open ceiling concept allows the flow of wind and light throughout the room. also, the abundance of white ensures a light, bright, and soothing decor. In contrast, the dark grey tones of the bed frame and cabinetry brings color and contrast to the decor. The recessed ceiling lights and lacquered finish of the bed and cabinetry give the room a sleek and edgy look. The grey tones of this bedroom give the design an elegant and refined look. The stark white walls, furniture, and pillows lighten the room and make it look more spacious. In contrast, the grey carpet, bedding, and sofa bring color, softness, and warmth to the decor. Low bed and leggy furniture are typical of modern design style. This simple white and wood tones bedroom design looks warm and welcoming indeed! the light white walls, ceiling, and bedspread lighten the room and bring calm and serenity to the decor. In contrast, the dark wood tones of the floors, bed frame, and nightstands give the room a natural and earthy feel. The wall art brings color, pattern, and a touch of modern style to the decor. The dark tones of this small grey bedroom give it a simple earthy look. The hardwood floors, full-sized bed, and wooden headboard give the room a uniform look. The large window lets in ample sunlight and lightens the dark atmosphere of the room. Moreover, the grey bedding complements the grey bed and brings out the contrasts in the decor. The beautiful white hanging lamps add style to the simple decor. Clean lines, symmetry, and use of organic materials such as oak and granite create warmth and add dimension to this custom home. The open layout of the room and the granite accent wall add a modern touch to the decor. The beige curtains and flooring along with the white walls and furnishings give the room a naturally calm look. The blue accents in this small modern bedroom design give it a soothing and calm feel. The dark blue throw and pillow give a grand look to the decor. Clever lighting fixtures illuminate the entire room. The lacquered finish on cabinetry and nightstands bring glamour to the decor. Moreover, the large pendant light and hanging lamps add a modern touch to the design. This neutral bedroom is certainly very bright and spacious. The white walls and ceilings make the room look even more spacious. Also, the many windows of this bedroom let in a lot of natural light and give the room a fresh and light look. The wooden floors, bed frame and headboard bring warmth to the decor. Similarly, the grey bed cover, cozy throw, and plush patterned area rug add color, pattern, and comfort to the design. This stunning bedroom design celebrates the earthy appeal of wooden furnishings and accents in any decor. White walls and ceiling lighten the decor and make the room look even more spacious. In contrast, the black details of the decor like the cozy sheepskin rug, nightstands, furnishings, and the patterned throw balance the brightness of the light. Similarly, the various tones of wood in the decor such as the light floors, dark-toned bed frame, and accent wall bring warmth and comfort to the decor. This industrial style bedroom is certainly warm and welcoming despite its edgy design. A neutral color palette of soft white and warm brown brings warmth and coziness to the design. The weathered concrete wall is certainly the main focus of the design. The weathered look of the wall is also reflected in the area rug. Moreover, the large full-length windows and clever lighting fixtures keep the room well illuminated. The exposed beams and ceiling fan further enhance the industrial look. Also, the stylish table lamp and wall lamp bring a modern touch to the design. It is a well-known fact that you cannot go wrong when designing with the classic white and wood theme. This beautiful bedroom is a perfect example for the case in point. This modern bedroom is certainly very warm and welcoming. The beautiful canopy bed, hardwood floors, and furnishings bring the wood tones in this white decor. The white walls and bedsheets reflect the light and give the room a bright, sunny look. The warm light brown tones of the bed and pillows further add to the warmth of the decor. This classic beachy look is certainly a favorite amongst designers and home-owners alike! This dark modern bedroom design is certainly very sleek and elegant. The white ceilings and carpeted floors lighten the room and reflect the light. The wall lamps and ceiling eyeball lights illuminate the darker areas of the room and also add a warm glow to the decor. In contrast, the dark tones of the black accent wall, dark cabinetry, and black bedspread darken the room and maintain the balance of light and dark in the decor. Moreover, the wooden furnishings add warmth and comfort to the sleek and edgy look of the design. Natural wooden floors and ceiling give this room a very earthy and natural look. The glass divider between the bedroom and bathroom is another feature of the modern style. The soft colors and functional decor is also typical of the modern design style. However, the soft whites and warm brown tones of the decor give the room a warm and welcoming feel. The cozy bedspread and throw further add to the warmth of the decor. The satiny colorful pillows and light purple throw bring color and shine to the decor. They also add a shabby chic and elegant look to the room decor.